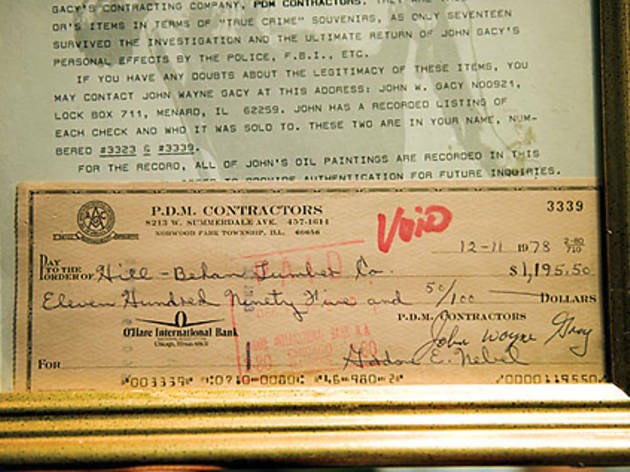 A Northwest Side man wants to unload his prized John Wayne Gacy art and artifacts. On January 28, 1990, Andy Matesi was tending to his Northwest Side store, Splish-Splash Collectibles on Irving Park Road, when a man walked in and made him a tempting offer. 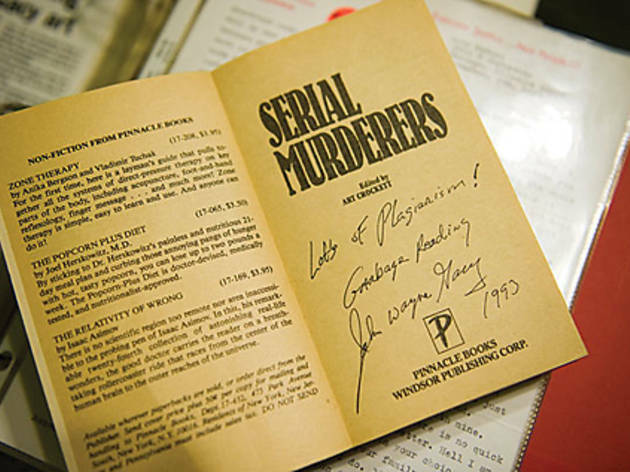 “He saw a photo of Charles Manson I had for sale on the wall and said, ‘How would you like to collect another serial killer: John Wayne Gacy?’” The man turned out to be Gacy’s lawyer. Within days, Matesi began receiving collect calls from Menard Correctional Center, where Gacy was sitting on death row. Over the next four years, until Gacy’s execution in ’94, Matesi was a de facto gallerist for the mass murderer. 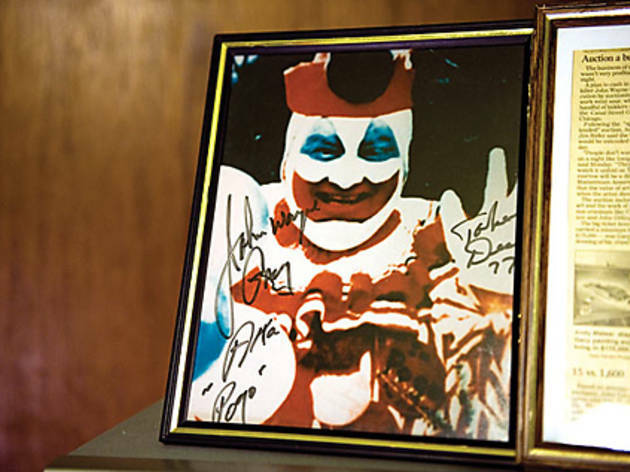 He had more than 20 phone conversations with the so-called Killer Clown (all of which he taped) and visited Gacy in jail a few times to pick up his paintings, which the Chicago native would buy with money orders, mark up and sell in his now-defunct shop. When we arrive at his modest, musty home in the Irving Park neighborhood on the Northwest Side (where he lives with his wife, a Manson buff), Matesi is excited: “So, do you want to see it?” In a small bedroom off the kitchen, the 58-year-old, wearing a sloppy aloha shirt, points to a table where his most cherished Gacy painting sits, leaning against a wall. “There it is,” he says in a hushed, reverent tone. “The house where it all happened.” The painting depicts Gacy’s home at 8213 West Summerdale Avenue in Norwood Park and the infamous four-foot crawl space where the contractor hid the remains of 27 young men and boys he tortured, raped and killed from 1972 until his arrest in ’78. (Two other bodies were found buried in the backyard and four in the Des Plaines River.) 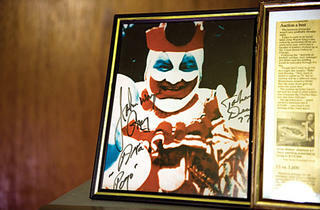 Peeking out from one end of the house, Gacy painted the chilling image of his alter ego, Pogo the Clown. 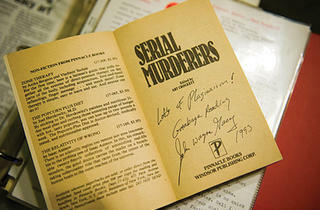 Matesi recently began hocking his “murderabilia,” which also includes typewritten letters on the killer’s prison stationery ($1,000 each), construction company checks from the ’70s signed by Gacy ($1,500 apiece), a replica of the Pogo the Clown suit that Gacy once wore in jail ($500) and a book titled Serial Murderers ($500) inscribed by Gacy with the snarky line, “Garbage reading.” The former auto mechanic says he plans to give 20 percent to the victims’ families and buy a vintage car with the rest. 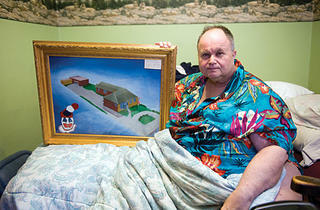 Three weeks ago, Matesi got $5,000 apiece for two Gacy paintings of Pogo the Clown. 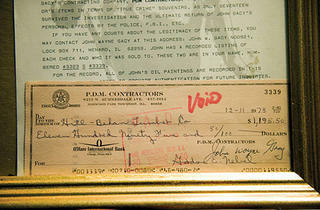 But for the crown jewel of his collection, the house painting, he says he’ll take no less than $100,000. “It’s the scene of the crime,” he says. 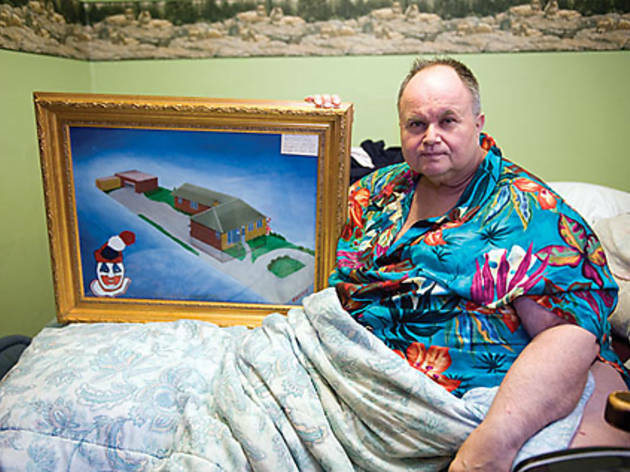 “I’ve owned about 20 Gacy paintings, but there’s only one house. He did 230 Pogos, 10 Elvises, 18 Hitlers—it goes on. Just one house.” Matesi hits play on a tape recorder, which holds one of the jailhouse conversations he recorded. “A handwritten letter of mine is worth anywhere from $1,000 to $5,000,” a deep, muffled voice says. Interested buyers can contact Matesi at 773-619-1768 or amatesi@aol.com.